Switzerland 1990. 35mm + 16mm, colour, 73 min. "Men in the Ring" is my personal contribution to the 700th anniversary of the Swiss Confederation. Hundwil: a Swiss village. Twelve houses grouped around a square. The people who live in these houses. In the centre the Landsgemeinde, the annual assembly of male citizens: "direct democracy"
Women’s right to vote, the event of the century. A traditional world with is values and its customs. This traditional order of things faces confrontation from today’s pressures. Old fashioned ideas concerning the division of the sexes are losing ground. At the same time an insecure new generation is searching for is identity, belief and future. I am trying to bring out this conflict. The film is a metaphor. It reflects conditions in a country as a whole. The questions of women’s suffrage serves as a model for other questions which all Swiss will soon be faced with. In 1992, the single European market will come. There is a big fear that the Swiss may lose their independence and self-determination, even their identity. People are afraid that minor structures which have grown over many years – not only traditions, also ways of life – may possible have to be sacrificed to the larger context. Of course, everybody knows that there will be changes in the year to come: they are very clear about that in their heads, however, they have not yet settled for it emotionally. The "Appenzeller", the typical local attitude, if you see it like that, which is in everybody’s mind in a world like ours, is not only a Swiss peculiarity. 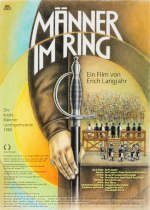 Männer im Ring was Erich Langjahr's anniversary gift to Switzerland on the occasion of its 700th year anniversary in 1991. 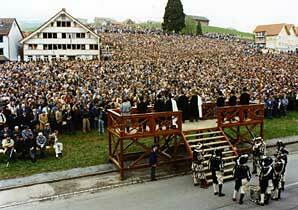 Its subject is the Landsgemeinde of Appenzell Ausserrhoden in eastern Switzerland, one of the few largescale examples of a sovereign, direct democratic institution which governs a territory. Less dryly put, it is the annual occasion where citizens gather in a village square to vote in their government for the next year and to decide policy issues, all by an open show of hands. The "men in the circle" of this film at one level depict a political ritual which has at least a 400-year tradition. The 'lived community' and the seriousness with which citizens take their duties towards the state come out very clearly, and serve as a reminder that democracy can mean a rather different kind of political participation than the anonymity of the ballot box. At another level, this is a discourse about the difficulties of Swiss identity in the late 20th century, and as such part of the quite self-critical tone of many contribution to the 700th year anniversary. 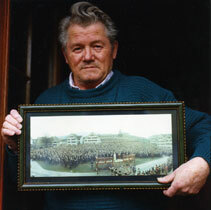 The confrontation between images and patterns from the past and the demands of the future are particularly evident in Langjahr's choice to document the Landsgemeinde of April 30, 1989, in Hundwil, the one in which the Ausserrhoden men after balking for 18 years – finally decided to admit women into cantonal politics. By the time this vote occurred, there was little disagreement that women had a right to participate: the problem was that it would mean the end of an exclusively male tradition, the Landsgemeinde. To many in the area, that was tantamount to the end of the institution itself. The 1989 meeting was also going to be the last chance for the Landsgemeinde itself to determine what the future would hold before the federal authorities and Constitutional Court forced the canton to accept women's participation - as they in fact did in the neighboring Catholic canton of Appenzell Innerrhoden in 1990. Langjahr documents the two months leading up to the Landsgemeinde as well as the event itself, and does so without voiceover. The sentiments associated with the Landsgemeinde are communicated entirely by the Appenzellers themselves - in particular, those who live in Hundwil where the meeting takes place. First we see a woman, doing her ironing in her living room and talking about the Landsgemeinde: from her we gather that the event takes place on the village square, and that the houses framing the square turn into a spectators' arena. She and everyone else who lives in a house on the square rents out her windows to the many non-citizen onlookers who appear for the occasion. But we also learn of her days as a small shopkeeper, her upcoming retirement, and the difficulties of making a living in a tiny, rural village. The scene shifts to a barber and a woman restaurant owner, both shown at work, who formulate their opinions about why women should or should not vote. And we watch over the shoulder of a young painter of naive art – a genre that celebrates traditional scenes of peasant life in a distinct style – while he talks of the need for change and how welcome women's political decision-making power ought to be. 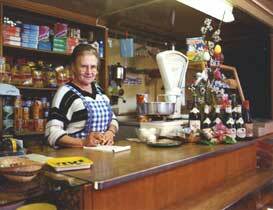 We also get to know the butcher and the baker, and watch them prepare the special foods for the Landsgemeinde as they think out loud about relations between men and women, between economic needs and work, between their village and political ceremony and between their home region and Switzerland. As the day of the Landsgemeinde approaches, Langjahr manages to familiarize the viewer with the relevant elements of the institution: costume and music, the swords which are worn by voters which serve as their sole means of identification, the wooden stage from which the elected officials direct the proceedings, and the food and drink that belong to the sensual experience of the Landsgemeinde. The build up to the crucial vote on moments suffrage is such that one senses the mix of festive joy and political tension, whether one knows the outcome or not. Langjahr captures an element in this film that viewers rarely experience: a turning-point, a moment of decision that irreversibly changes the contours of public (and perhaps also private) life. His film gives us just enough of a pause in the flow of events to reflect on how tradition and innovation interact for individuals and for a collectivity, providing a human dimension to an event which may pass us by as a brief radio or television news note. In a world seemingly torn between the calls of international universalisms and local patriotisms, Langjahr reminds us that there may be a place to shape meanings through collective decisions. He makes sure to remind us as well that while we may prefer progressive directions, individual and collective processes may remain stubbornly wedded to the past, and may take years to overcome. The picture is framed by shots of the landscape, a cinematographic replication of the harmonious views achieved in the local style of painting. The portraits of individuals worked into the documentary are intimate yet non-intrusive. There is an ease and warmth about the entire film that manages to convey understanding and compassion for the conflicting views and values which are expressed. Männer im Ring has been awarded the grand prize at the 19th film festival of the International Institute for Human Rights in Strassbourg and has received honorary mention at a number of documentary film festivals. Langjahr's gift to fuse artistic direction and conscientious documentation make his film an excellent vehicle for understanding Swiss political culture.